The Skinny: How to Turn an interesting story into predictable melodrama. Hideyuki Hirayama's adaptation of Kaoru Kitamura's bestseller is ambitious, well produced and well acted. But after an interesting first half, the film languishes in stupid subplots - and the end feels like a cop out. Better luck next time, though "next time" might be a Hollywood remake. by LunaSea: Maki (former idol and TV drama star Riho Makise) is an artist trying to find inspiration. She doesn't really care about acclaim, and figures that eventually it'll come. She also doesn't seem to have many friends and is content just talking with her mother. One day Maki has a car accident and is suddenly transported into another dimension, where she is alone. She can't go forward or meet people, since every day at 2:15 she returns to the same exact spot with nothing having progressed. It seems like life as she knew it is over for her. Then, after four months of coping with loneliness, the phone rings. Maki is shocked because this may very well be a call which will change her new "life" forever. Using time as a plot device is nothing new, as both anime and live-action films have used it often. In the last five or six years, Korean Cinema has been particularly guilty of this. The usage of time can make or break the story though, as it's often used as a mere background to a conventional story. Using Kaoru Kitamura's novel as a launch pad, director Hideyuki Hirayama's effort seems to be a little smarter than usual. The director actually tries to use time in a meaningful way. Maki is completely alone, which brings absolute loneliness. However, in a move that few films of the "genre" attempt to expore, being alone also brings Maki absolute freedom. Her character is free to do whatever she wants, from stealing cars to wearing expensive clothes. 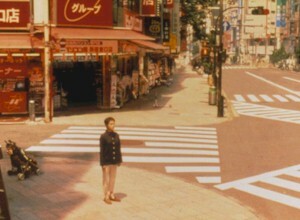 One of the problems of the film is that it doesn't give enough depth to Maki's dilemma. A good half-hour is spent showing how she passes the day, adapts to the inevitable changes, and discovers her newfound freedom of choice. Problem is, the "McGuffin" of the phone call comes in, and the film turns too quickly into something entirely different, and perhaps something not necessarily needed. There are ups and downs after that: one moment it seems like the film is turning into a sappy melodrama, then it regains ground with some intelligent themes. The director throws another bone to the audience with a subplot that means absolutely nothing to the overall story, and he returns to showing Maki trying to cope with loneliness. This uneven pace hurts the film a lot; the "focused" parts of the film are quite good, but the rest of the film feels like a compromise. This seems almost inevitable, since the film was done with the audience's "pleasure" in mind.